Great treasure. Great danger. Great glory. In the Temple of the Bronze Flame, players face a gauntlet of terrors as they attempt to free a sacred phoenix who can offer them the greatest reward of all - the chance to become heroes. Adventurers who succeed here will need every ounce of courage, willpower and wit. Failure means only one thing - certain death. 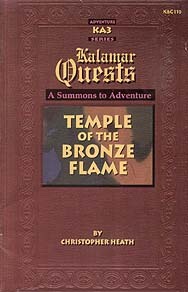 The Temple of the Bronze Flame Kalamar Quest adventure and supplement is designed to provide both a challenging adventure and useful supplementary campaign material. The material within is set in the popular Kingdoms of Kalamar fantasy campaign setting but can easily be used with any fantasy role-playing game setting. Ths game adventure and supplement is suitable for use with any fantasy role-playing system, including but not limited to Advanced Dungeons & Dragons, Rolemaster and Hackmaster.